Construction is started late in the year. 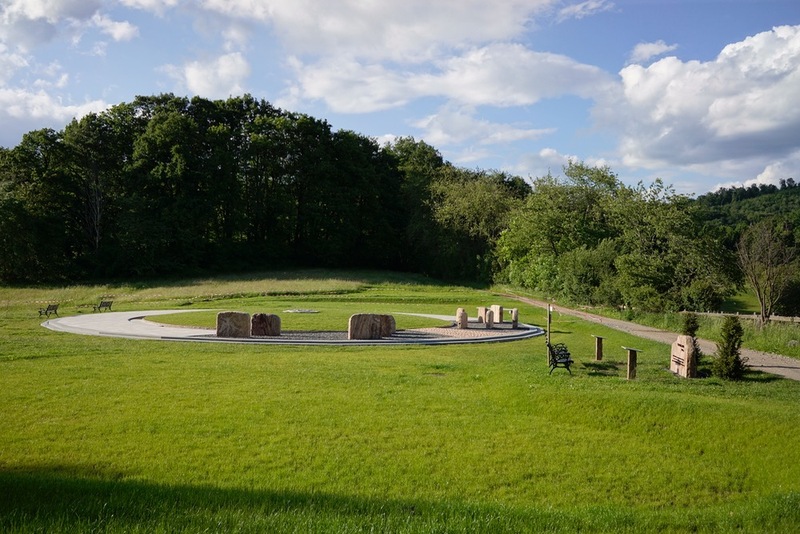 The grass required gentle treatment to grow, which is why the terrain was closed to the public until May. 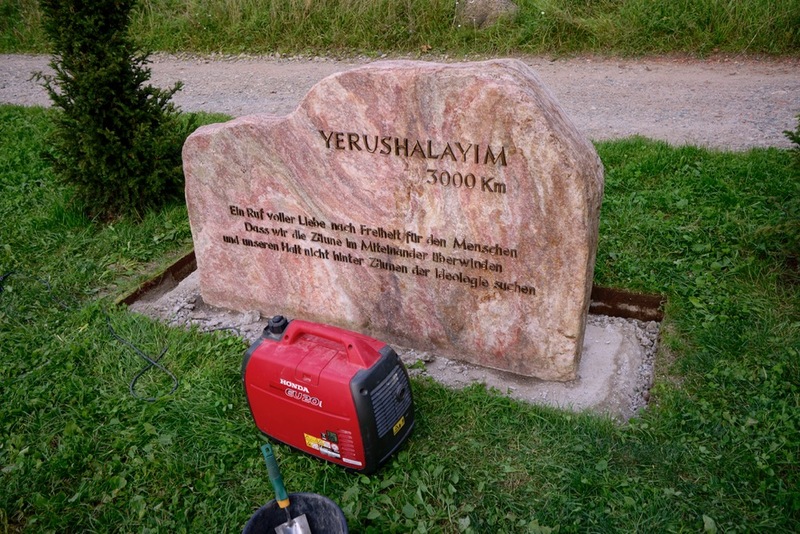 Moreover, the district authority ordered a halt to construction at the beginning of the year because of our drainage measures and ordered the “dismantling” of the Border Stone, the commemorative stone outside with the inscription: Yerushalayim. The drainage measure is very successful. The water drains properly from the terrain and it looks very good. A view of the drainage trench alongside one of the “angel’s wing”.. The road is now significantly drier and more resilient, thus requiring fewer maintenance measures. The barriers have been removed. The grass has grown to full satisfaction and can now be walked on. The levelling measures in a big scale of a few months earlier are barely visible anymore. 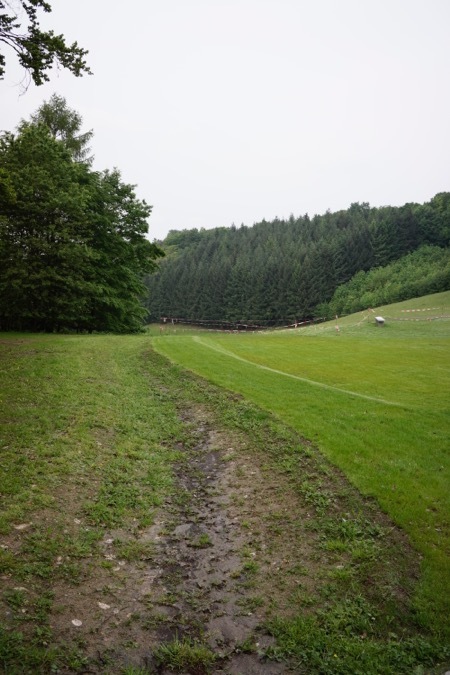 Unfortunately, the drainage measures were cause for a conflict with the departmental head of the Bergstraße district. Our complaints about the drainage problems had been ignored by the authority for about a year before we finally became independently active Instead of confronting our association directly about this unauthorized measure – only taken by us to protect the structure of the monument – the district authority issued a demolition order for the Border Stone. This Stone was constructed 1.5 years earlier, without sparking any type of protest from the authorities before. Now, the authority objected to this stone, covering a surface of 1.3 sqm, stating that it represented an unauthorized intrusion to the natural scenery. The stone was indeed not included in the construction permit. Pursuant to §35 BauGB (Town and Country Planning Code), a stone of such a nature can be constructed on the own plot as long as it does not infract on any public interest. 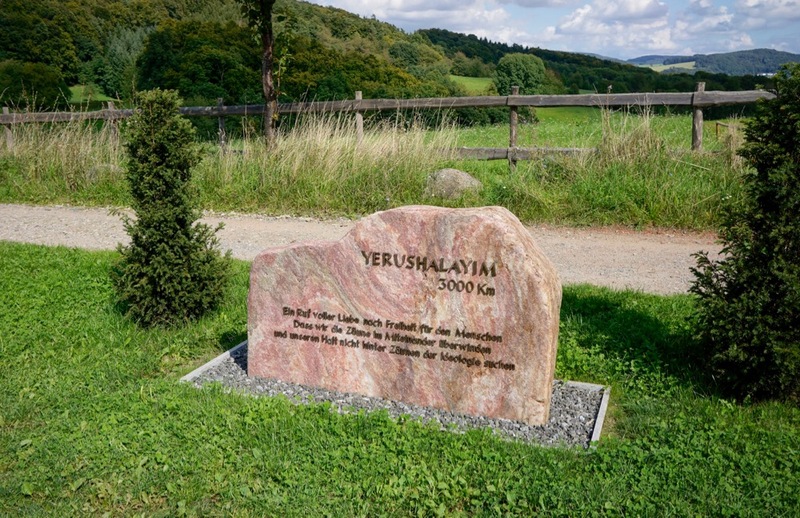 Additionally, the authorities did not recognize that this single stone was erected to replace 22 other – authorized – stones of the same size on our plot. The motivation behind this measure was to protect the natural scenery in the first place. 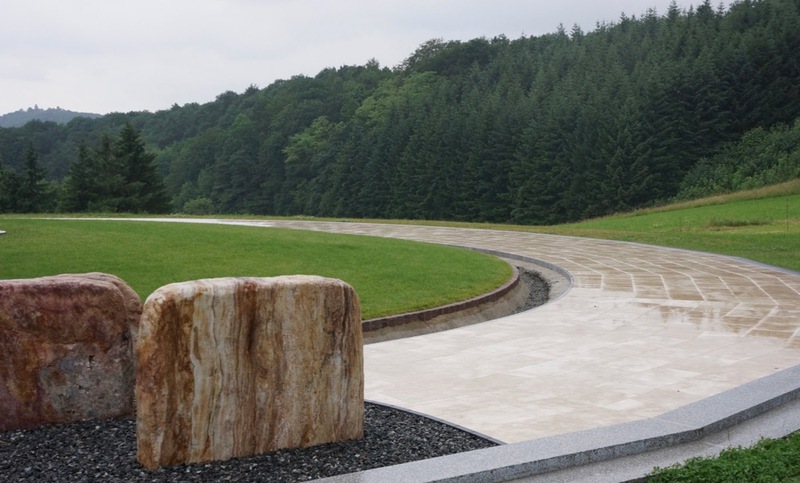 The construction of a fence on the neighboring plot, directly in front of the monument and with a special permit, suddenly interfered with the intended effect of the monument design with the 33 large commemorative stones. A monument that is overwhelming with a fence in front of it cannot properly convey a message of peace and freedom. 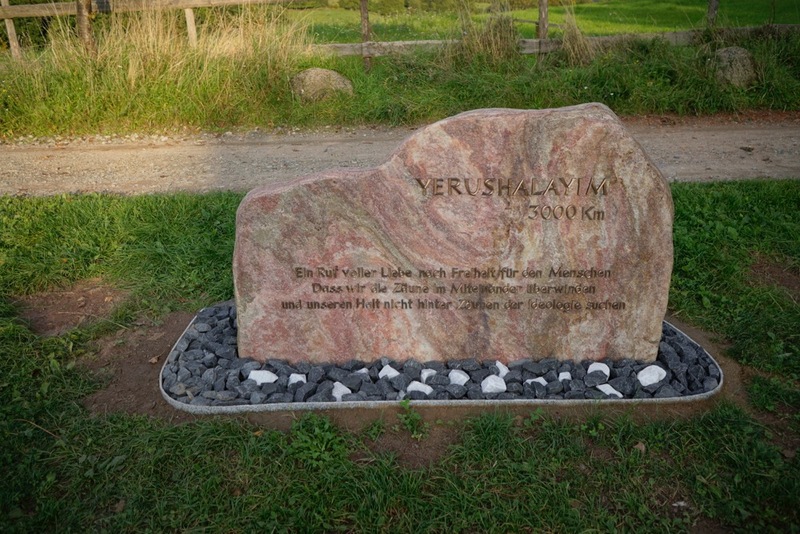 I therefore removed 22 stones and replaced them with this one stone (the Border Stone), to preserve the meaning of the artistic message of this monument. Two information panels surrounded the stone. 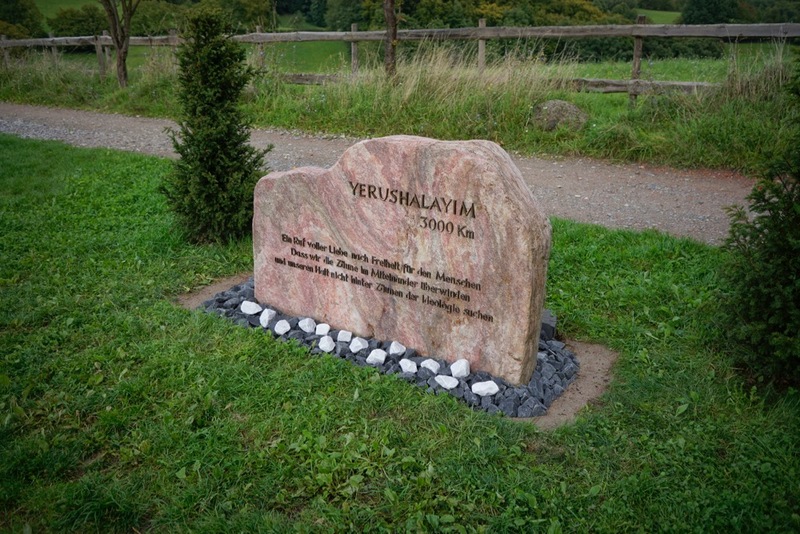 The Border Stone became necessary to handle the changes introduced by the fence – the new border at the monument. It was an artistic response. In other words, this change had to be integrated into the work of art, changing its nature. In addition, with the design of embankments (angel wings) on the sides of the monument area and a levelling around the monument circle the fence got a different aesthetic function: from a blockade in front of the monument, the fence became part of a frame; a safe space for the Circle of Peace. 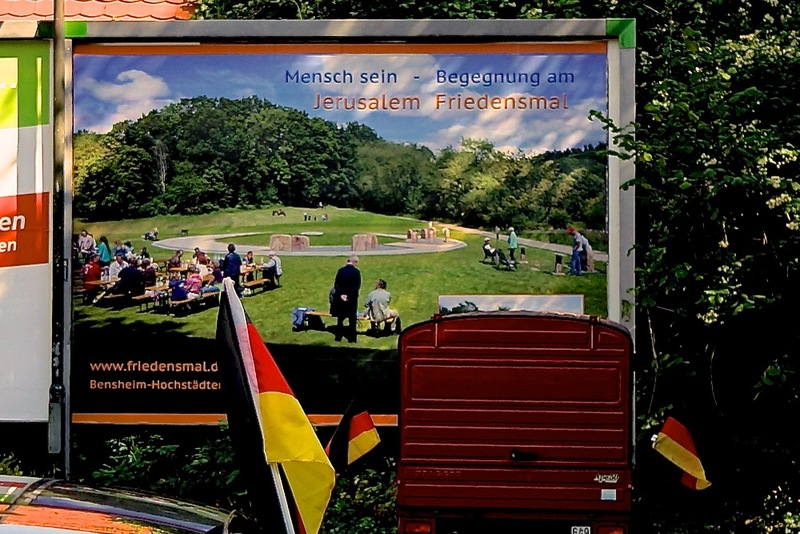 I am friends with a rabbi who proposed the following: He wanted to offer his support by celebrating the Jewish fest of Lag baOmer in the Garden of Freedom, together with his congregation. Lag baOmer 2014, Garden of Freedom. 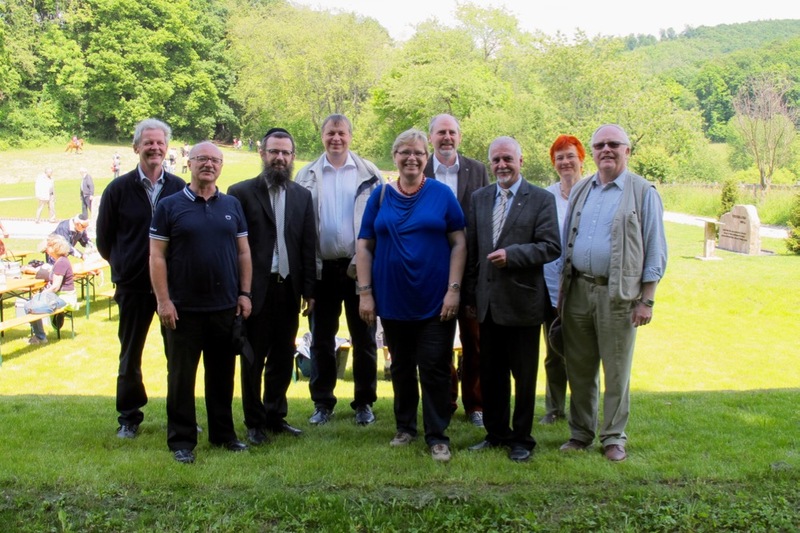 People from Hochstädten and the Jewish congregation from Karlsruhe meet. From left to right: Bernd Rettig (Local Representative Hochstädten), Franz Apfel (Chairman Bürger für Bensheim), Rabbi Mendelson (Jewish-Hasidic Congregation Karlsruhe), Rolf Richter (Mayoral Candidate for the CDU), Sylvia Kloetzel (Mayoral Candidate for the SPD), Thomas Zieringer, Jürgen Kaltwasser (Mayor of Lautertal), Maria Mrotzek (back then 2nd chairwoman of our association), Roland von Hunnius (Deputy District Mayor Bergstraße). I came up with the idea for a poster action, to “tell the story” of our celebration in the Garden of Freedom. 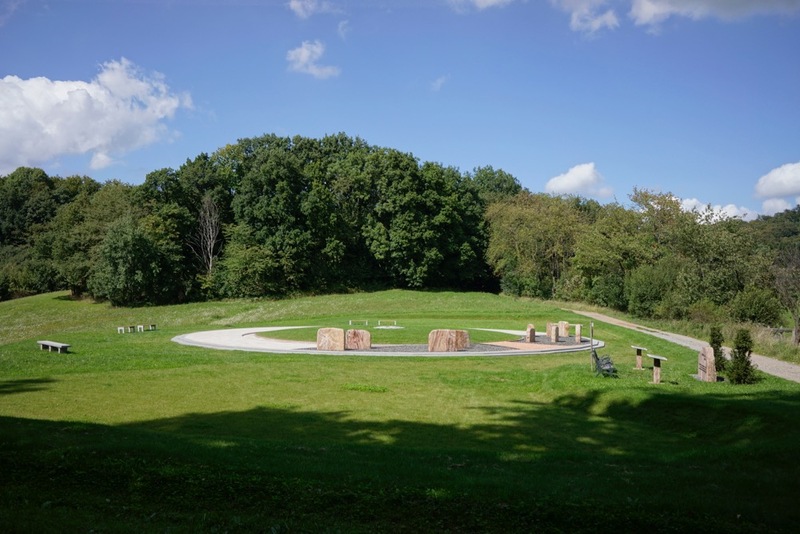 It should show the public the value of this monument site and help preserve it in its current form. 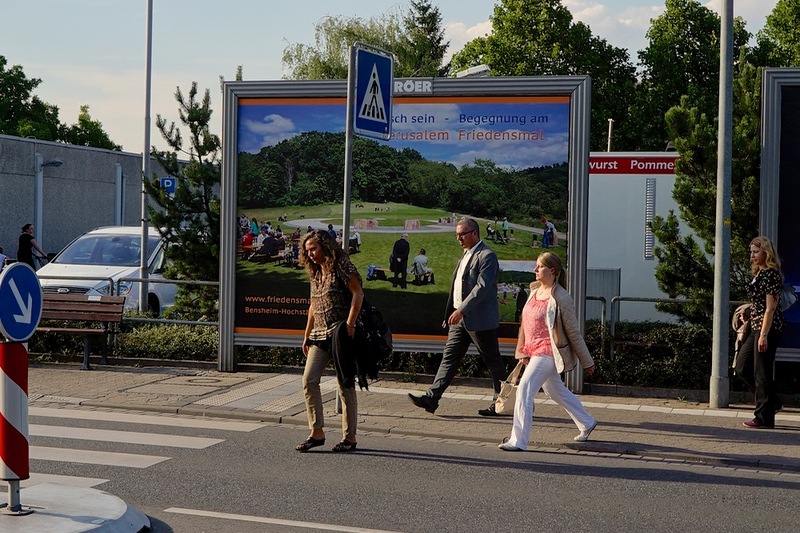 I reserved all hoardings in well-visible spots in Bensheim for two weeks. Many posters ended up hanging there for much longer. Even before the conflict with the district authority started and before they ordered that construction be halted, all major construction activities were completed. 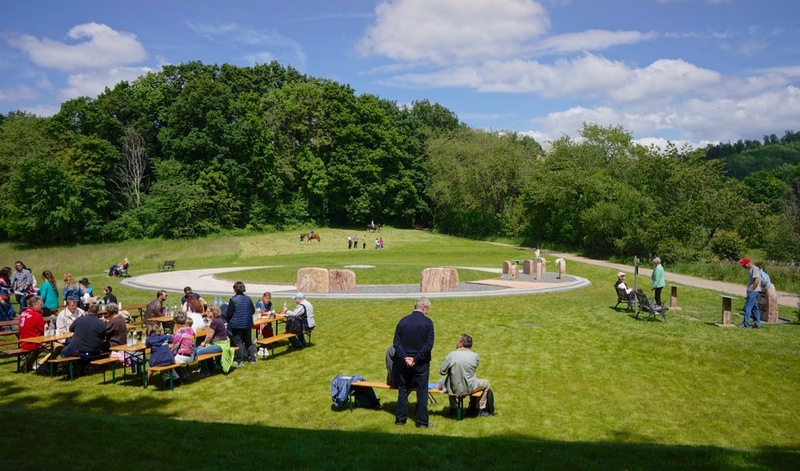 On June 9, I wanted to continue my work together with Freddy Thom and Ferdl Zanitzer to finish the necessary smaller tasks that weren’t affected by the building freeze. Some last things still needed to be finished in the monument's circle. 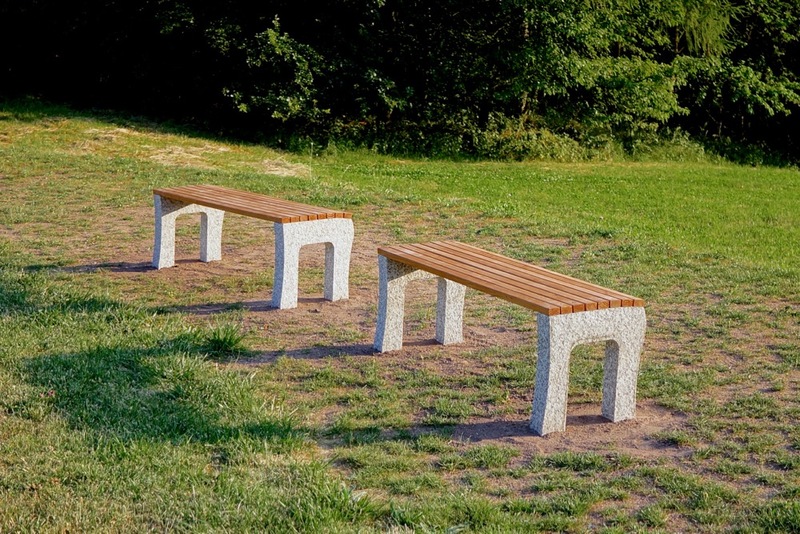 The installed benches, which came straight from the hardware store, had to be replaced by exclusive benches I designed myself. The gap between the “dance floor” in the monument and the inner circle can be seen in the picture. This gap must be closed. 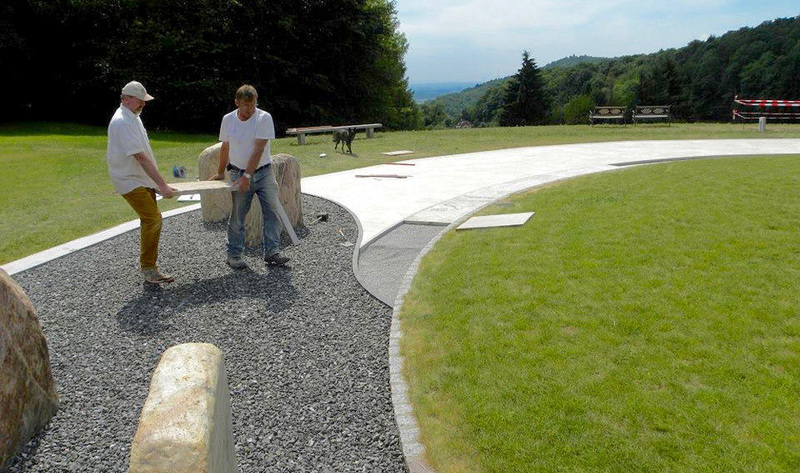 At first fine gravel has been poured into the gap, on which we place Odenwald quartz slabs. I selected this attractive material for this spot as well, commissioning the company Quartzwerk Dude with the production of the slabs. It’s difficult to manufacture slabs as thin as these, as the glass-like material is very brittle. Working with the material on-site was equally difficult. Each plate was cut to size by hand. I first created a blueprint for each plate, which showed how the slabs were to be positioned and Ferdl used these to cut them to size with an angle grinder. 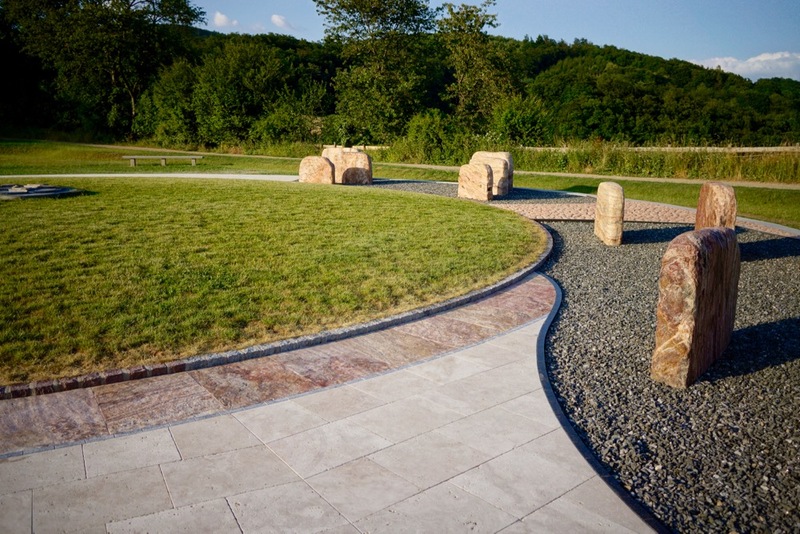 The inner circle consists of natural stones without even surfaces. The slabs were cut such that they incorporated this uneven profile. I created my own benches and had the granite cut to size with a waterjet cutter. Note the fine sweep of the arches. The authority is still taking action against the peace project. 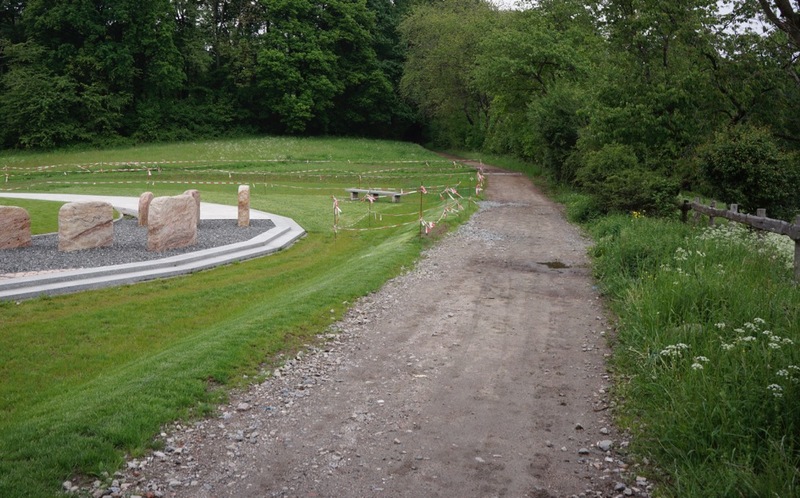 However, the objections have been not only leveled against the Border Stone at the side of the walking trail. 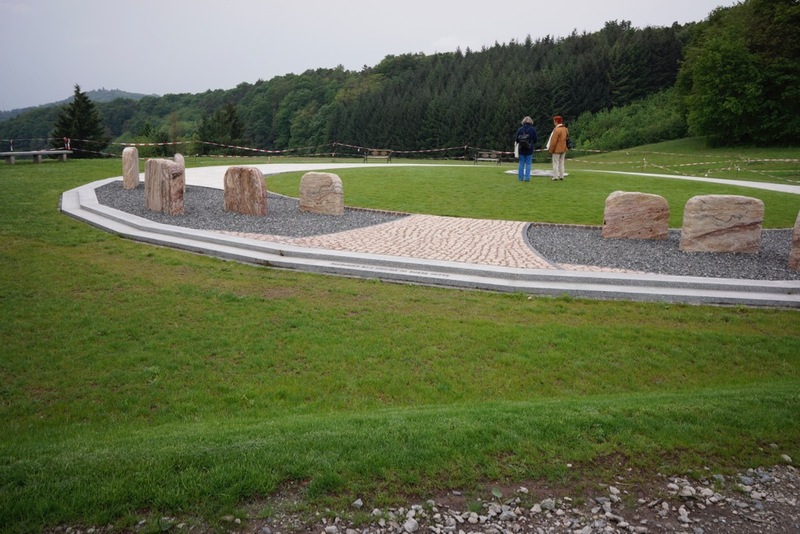 The authority also objects to the benches, information panels, and the way the bed of pebbles encircles the stone, which was to resemble a gravestone (not true). Actually, we just positioned the stone into a bed of pebbles as it is common practice because you can count on a long shelf life. Its true, that gravestones at a graveyard are placed in a similar manner. However, the idea of a “graveyard” never came to mind as I designed the Border Stone. This stone and its inscription speak about life. We continue our battle for the preservation of the Border Stone. Our lawyer was on the verge of reaching an agreement with the authority. As a gesture of goodwill, I decided to invest some more effort and change the border of the stone. I first removed the old frame and small pebbles. The gravel bed and new frame, still to be constructed, should convey a livelier impression with its more organic form. The redesign of the gravel bed was successful!